Software leaders are once again tipping their toes into social media but this time they're being considerably more cautious. Last year, Oracle spent almost a billion dollars on a marketing tool that few people had ever heard of. Moat is used to audit social media ads and ensure that they’re showing up on Facebook and Google, as promised. But the exact function is largely beside the point. What’s important is this: Once again, big-time software players like Oracle, Adobe and Salesforce are turning their attention to buying up social media and related tools for their marketing clouds. And this time around, they’re confident that things will turn out better than the last buying spree. Let’s rewind five years or so. Back in the early 2010s, the concept of the unified marketing cloud—a single collection of integrated tools for marketing teams, embracing everything from email to analytics, campaigns, ads and more—was still fresh. Adobe had been among the first to the scene, but other industry heavyweights were racing in with their own alternatives. At the same time, social media as a business tool remained a novel concept. Facebook had been around for years, but companies were only just beginning to explore how social networks could be used as a part of a serious marketing strategy. Early social media management tools promised to solve their pain points: simplifying publishing of messages across multiple networks; “listening” to social buzz to pick up and identify consumer trends; and spitting out analytics reports to measure the impact of social campaigns. It was in that uncertain climate that some of the biggest names in software began dropping literally billions of dollars on emerging social tools. In fast succession, Salesforce acquired social listening tool Radian6 in 2011 for $326 million and social publishing tool Buddy Media in 2012 for $745 million. Adobe scooped up Context Optional and ad tool Efficient Frontier for a rumored $400 million in 2011. In 2012, Oracle acquired social marketing startup Vitrue for $300 million. All of these technologies promised to add a robust new social media component to existing marketing clouds. Press releases touted the coming social business revolution. Then, crickets. After news of the high-priced acquisitions died down, eager CMOs waited… and waited… for these new social tools to roll out. Some were mothballed almost as soon as they were bought. In other cases, integrations took years, with results that were patently underwhelming. The post-mortem on the first wave of social cloud applications reveals a host of fatal errors. For starters, social media itself was misunderstood. At the time, it was still thought of as a siloed function within a business: the domain of a lone social media manager and small team of social savvy millennials. There wasn’t yet an appreciation for how social pervades the entire buyer’s journey, from product discovery to consideration, purchase and advocacy. Precisely because social media was thought of as an “add-on,” it was relegated to a peripheral role in early marketing clouds. Rather than being part of the central “brain” of these platforms, it was treated as simply another system of engagement—no different than an email application or a messaging service. Customer data from other parts of the cloud didn’t flow freely into social tools. Nor were these tools engineered to gather and organize insights from customers. On top of this, the initial crop of social media marketing tools were largely untested. It’s important to remember that the early 2010s were still the nascent days of marketing technology. The promise of automating and refining mundane marketing tasks—and finding ways to track revenue from campaigns—had whipped marketing teams at companies big and small into a buying frenzy. (Gartner famously predicted that CMOs’ tech budgets would soon outpace CIOs’.) Big software companies were eager to get in on the action. So Salesforce, Oracle and their peers ended up doubling down on tools that may not have been quite ready for primetime. The combined result was disappointment. These new social media additions were hard to use, non-intuitive and not well integrated—afterthoughts, rather than central pieces of the marketing cloud. As a result, marketers who wanted serious social media tools were forced to look outside the big clouds and instead rely on more targeted point solutions… which kind of defeated the purpose of buying a comprehensive marketing cloud in the first place. Just five years later, however, the situation has changed markedly. Social media has proven less a technological fad than a cultural sea change. Thanks to mobile technology, the average user now spends two hours on social media every day. Teens (i.e. tomorrow’s consumers) spend up to nine hours a day. Companies have come to recognize social media as possibly the central tool for reaching customers—both B2B and B2C—and guiding them from discovery to purchase. Likewise, social media management platforms available today have matured substantially from the earlier wave of acquisitions. AI-powered analytics tools enable separating “signal from noise” in a way inconceivable just a few years ago—sorting through millions of data points to identify trends and consumer sentiment at a glance. Meanwhile, with social ad spend now surpassing TV spend, new ad buying tools have emerged to launch, automate and maximize ad campaigns across social networks. Social platforms have likewise evolved to serve not just the narrow needs of marketers but also sales and customer service teams. Perhaps most importantly, the role of social media within marketing clouds is being fundamentally reconsidered. 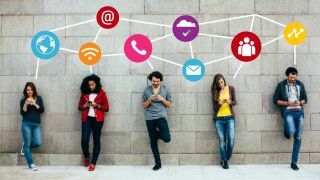 Far from an add-on, social media is increasingly being appreciated as a system of record, fully integrated with other cloud features and capable of gathering and receiving data. Because social affords direct, sustained contact with buyers throughout the customer lifecycle, it’s well positioned to act as a kind of backbone for marketing clouds. So, will all of this translate to what CMOs have been asking for all along: stronger marketing clouds with better social tools and more intuitive features? Time will tell. It’s noteworthy that, in addition to Moat, Oracle (with its marketing cloud GM Laura Ipsen and marketing-minded data-cloud leader Eric Roza) have made a flurry of marketing technology acquisitions in the last year or so. Similar signals are coming from the likes of Adobe, where digital marketing head Brad Rencher and his team scooped up video ad platform TubeMogul for $540 million. It also seems that Microsoft is again exploring its own marketing cloud options. Their $26 billion acquisition of LinkedIn represents a valuable social media addition to Microsoft’s Dynamics CRM solution for enterprises. And some commentators have speculated that Microsoft’s partnership with Adobe’s Marketing Cloud could be hinting at an outright acquisition down the road. After a half-decade partial hibernation, in other words, it appears the big software companies may be gearing up for another MarTech buying spree. Considering their first foray into social, Oracle, Adobe, Salesforce, IBM and other software leaders are being considerably more cautious this time around. But the holy grail—an integrated social platform that just works as part of a marketing cloud—may well be within reach this time. The key: a dawning appreciation that the right social media application isn’t just another marketing widget, but the primary interface to engage the next generation of buyers.